This access plan is temporary until the development of the Highpark land. The closure of the Western Avenue Gate is neither Mary Star’s decision nor preference. Our administration and staff will do our utmost to provide traffic safety for our students. In order for this transition to work smoothly, it is essential for all parents and drivers to cooperate fully and abide by these traffic rules. We ask that parents avoid using any side streets and enter the campus off of Westmont and Taper Avenue only. If you cannot avoid using a side-street, please remember to drive cautiously and be courteous to our neighbors. With rain today and in the forecast, it is an important time to review the MSHS drop off and pick up procedures. Firstly, the speed limit on campus is 15 MPH. Please DO NOT at anytime use the firelane, enter the faculty parking lot, use the dirt lots on the north side of Taper Avenue or move traffic cones. Please be patient during these rainy days to keep our students and campus safe. This access plan is temporary until the development of the High Park Land. The closure of the Western Avenue Gate is neither Mary Star’s decision nor preference. Our administration and staff will do our utmost to provide traffic safety for our students. In order for this transition to work smoothly, it is essential for all parents and drivers to cooperate fully and abide by these traffic rules. We ask that parents avoid using any side streets and enter the campus off of Westmont and Taper Avenue only. If you cannot avoid using a side-street, please remember to drive cautiously and be courteous to our neighbors. Picking up students 10-20 minutes after dismissal often reduces congestion after school. To prevent traffic jams and provide safety for our students, we request parents not drop off their students at the Taper Avenue/Westmont or Taper Avenue/Sandwood corners. Student drivers must park in the student parking lot and may not park on neighborhood streets. Students who do not follow this rule will be issued a Deans detention. Parents wishing to conduct school business or pick up their child during the school day must enter through the Taper Avenue Gate and may park in the (gravel) parking lot on the northern side of the property directly across from the school. Please note that the gates will be closed during break and lunch to ensure the safety of our students. We ask that parents plan appointments around these times. Parents and students are asked to follow the directions of Mary Star staff members and City Traffic Control Officers. All Mary Star drivers MUST adhere to the speed limit of 15 MPH while on campus. Please DO NOT at anytime use the firelane, enter the faculty parking lot, use the dirt lots on the north side of Taper Avenue or move traffic cones. Parents picking up students must enter and exit the school from the Taper Avenue Gate. The Gate opens at 1:45 p.m. Parents picking up students must continue on Taper Avenue to the turn around on the west end of the property and proceed to the coned pick up area in front of the school where they may park and wait for their students. Please do not block any driveways while waiting for students. Parents may not wait for or pick up their students in the gravel parking lot area. This area is for parents conducting school business and/or attending games only. Cars may not enter the faculty parking lot to pick up students or to turn around. To prevent traffic jams and provide safety for our students, we request parents not pick up their students at the Taper Avenue/Westmont or Taper Avenue/Sandwood corners. Parents are not to block any driveways on or off campus. Also, please allow student drivers to exit the student parking lot and stop for student pedestrians. 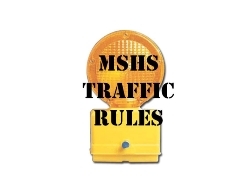 Parents entering campus during student pick up time to conduct business or attend games, MUST park in the northern gravel lot across from the school. NO PARKING WILL BE ALLOWED ON TAPER AVENUE BETWEEN 1:45 PM AND 3:15 PM. Parents and students are asked to follow the directions of Mary Star staff members and City Traffic Control Officers. All Mary Star drivers MUST adhere to the speed limit. Student drivers who do not follow traffic laws/rules will lose their campus driving privileges.